it’s a little hard to believe that christmas came & went and now we are diving into the season of lent. i know some of you love this season in the church calendar and some of you can’t stand it. i am one of those people who like it. the part i appreciate the most about it is the intention. i like ways to help me remember God, connect with my humanity, and soften my so-easy-to-become-hardened heart. 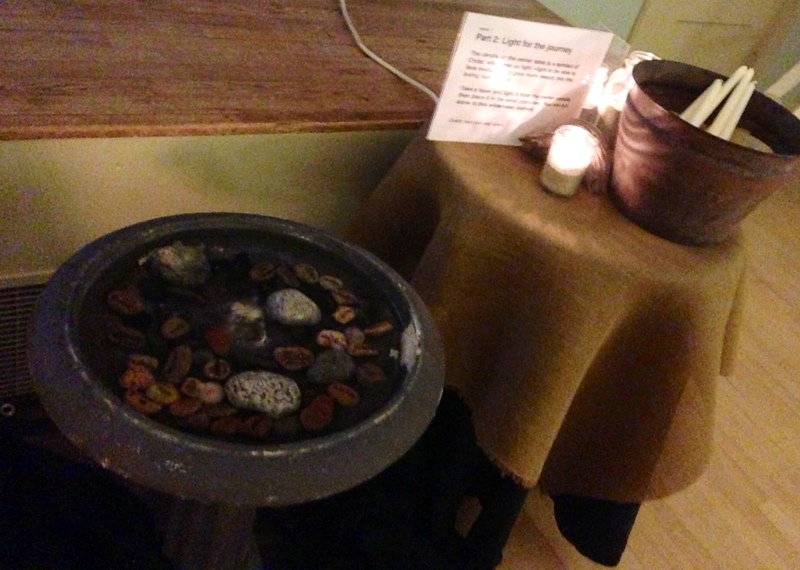 one of our refuge traditions is that we host a sacred & contemplative space on ash wednesday to begin the 40 days toward easter. the theme of this year’s gathering was “thirst.” i can’t re-create the stations or the moment, but i thought i’d share one of the reflections here for formation friday because it was such a great way to start the season. i do not drink enough water every day. coffee, no problem, i never lack for that. a diet coke, oh how i crave one sometimes. but water, the thing i most need to make my body work properly, that is the thing that seems the hardest to do. it really is how i often live so much of my life: the thing i need most is the thing i seek after the least. it bugs me, really, my natural bent toward not-doing-what’s-really-good-for-me. 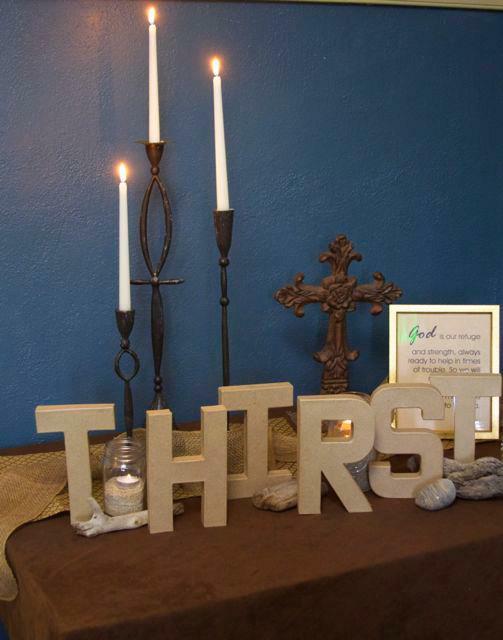 this lent, i am thirsty. not for diet coke and coffee. i’ve got enough of that in my life. 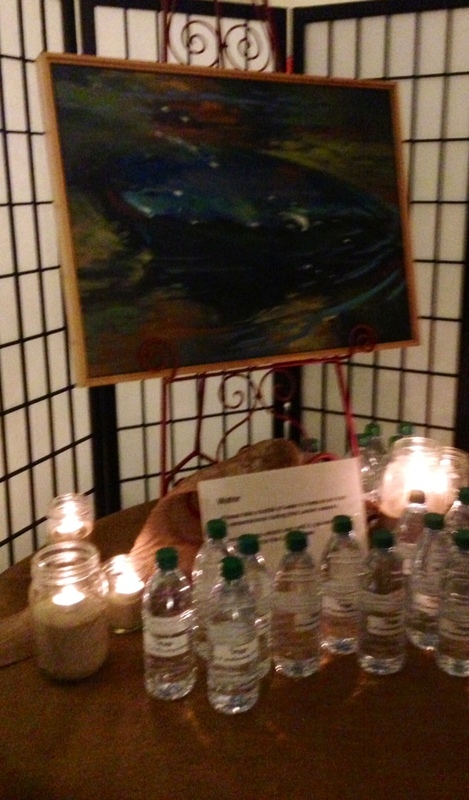 what i need more of is living water, the kind only God seems to be able to provide. the holy spirit working and breathing new life and redeeming and restoring and healing and strengthening and transforming and encouraging and making-me-new-and-then-new-again. the kind of water that satisfies the deep places of my heart and soul and reminds me that i’m loved. that i’m enough. that i’m human. that i’m not alone. that life is greater than death. that good is greater than evil. that God is always near, pouring goodness & truth & peace & love & hope into this flawed & broken pot. if i will just go to the well and drink. on my israel & palestine trip, i went to jacob’s well, the place where Jesus met the samaritan woman at the well in john 4. it’s one of my favorite stories and it’s almost 100% that the well we stood at was the exact place where Jesus met her (you can’t fake a water source). my mom and i both drank the water from that well. and i’ve got to tell you, it tasted good. like really good. it made me want to drink more. i’m entering into this lenten season thirsty. part 1 – acknowledge one thing you are thirsting for; one place where your soul feels dry, that you can continue to reflect on during this season. write it down on a stone and place it in the fountain, asking God to bring water to it. part 2 – the candle on the center table is a symbol of Christ, who gives us light, to be able to face reality, and gaze more deeply into the loving face of God. 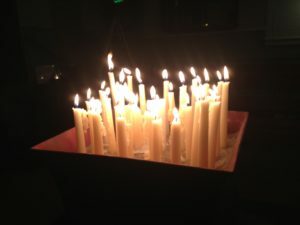 take a taper and light it from the center candle, then place it in the sand container. you are not alone in this wilderness journey. we did a few other things in the midst of music & scriptures & prayers and all left with a water bottle to use for the next 40 days to remember that we don’t have to go thirsty. [quote]let this water be a symbol, not just of life, but of transformation. remind us of you, God, as our source. Living Water, flow into our parched souls. 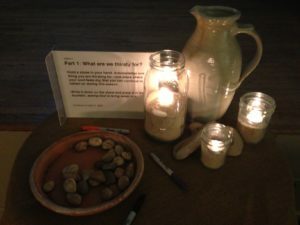 ps: if you want to get some really great lent resources, check out christine sine’s blog. always such lovely stuff! next week i’m going to share more about her new book, return to our senses: reimagining how we pray. ← the road to equality is paved with friendship. Love this Kathy. What a beautiful service. Wish I could have attended! it was really pretty. for a little nutty church we do some lovely stuff. Normally I dismiss Lent as being all about religion, but this year something stirred deep and I made the decision to drink only pure, fresh, clean water, nothing else. Thanks for sharing Kathy, so beautiful. thanks for sharing. that’s beautiful! My wife, Mary leaves for Israel three days from now. I am thinking we may have to take a field trip to the Refuge next year to share stories and to share in your Ash Wednesday experience. that’s awesome. i look forward to hearing about her experience and we’d love to party with you here sometime! thanks, randi. our trip was pretty darn cool. this wednesday at our house of refuge i’m going to share all the pix so i was looking at them today. what a wild and cool experience! i love psalm 63, too. thanks for taking time to share. i do hope to keep figuring out ways to share some of these more experiences more here this year! As I reflect on your postings today, I realise that for me, I had a honeymoon pereiod with visiting your blog which had come to an end but now I feel OK to be me while I am here, settled in. Thank you for the provision of that. It is different to a lot of my church expereinces. Thank you for your willingness to take risk and have to courage to share in the way you do. I hope to use the power available to me to encourage you at the appropriate times and to see that working for you as it has on one or two occsaions so far. So – I’m learning somethign else about you tdoay. Not only are you a “nut”, you are a caffene addict. So when are you booked in for psychiatric attention and rehab? *wink* Joking. I’ve always thought there is an endearing quality about cracked pots ;). Makes me feel OK about my “eccentricities” to be in the company of like people. Istn’ that a great story about the woman at the well. How Jesus uses water as a metapor and elsewhere in scriptur that talks of being stearms of living water. And how in the situation forthe woman, by her encounter with Jesus she is enabled and challegned to be an evangelist to share good news about him. I bet she didn’t realise that when she went out to fetch water that day, the kind of water she would be returning with was a message about life in its fullest! When I read what you have wirtten today about being thirsty, my mind goes back to the beattitudes and those that thirst for righteousness being blessed. I was at a meeting last night with a pastor who’s ministry is to go out on the street, in the crack houses and rescue people from that life. He sacrificually sold his house, bought an old church with more space and brings people in so they would have a place to sleep. He depends every day on the generocity of others, for him and the men he is with to be able to eat. And the storys the men there shared were of literally life or death situations. Jesus being the “water of life” for them in a lot of cases literally meaning that if it wasn’t for Jesus they would not be alive today. Normally I would have some opinion to express at this point in time. Being a theology masters student, it would come naturally to me to want to give out some theological insight whther that be driven by my own ego or our of pure motive. But I am humbled into silence on this occasion by the memory of the talk that was givne last night. It challenged me to weigh up whether my life reflected that of what Jesus calls every one of his followers to do in that “those that keep their life will lose it and those that lose thir life for my sake will gain it”. I recall someone once saying “it is no fool that gives up what he cannot keep, to gain what he cannot lose. wow, that’s a pretty story of your friend , the real deal. beautiful. Yes – it really challenged me bout what I do. I know I coudn’t do what he does and the good thing about what he shared is about him not being able to do what I and others can. The different parts of the body. I guess with the study I do I’m more of a head person. If I try to be a hand it aint gonna work. Hearing him spek made me appreciative of the “hands” we have in the body in a new way. Reminds me once of a boss that said that I was like square peg in a round hole with what I was doing and suggested a change for me. With that change came freedom :). My Lenten fast was to give up flesh for the season, and give away the money so saved. The diet change has been fine. The problem was discovering I can’t even ballpark how much to give, because I have no idea about my diet. Or my budget. And fixing *that* mindlessness is a much taller order than going ovo-lacto for six weeks. “the thing i need most is the thing i seek after the least.” Alas, and amen. yeah, it’s kind of weird, all of the things we are unaware of. we were talking last night about hunger and how little those who have resources & can just buy what we need whenever we want it are in touch with it. thanks for sharing, nice to hear from you! So so good. I personally was not in touch with how really freaking dehydrated I was/am until the beautiful Ash Wednesday service. I have heard that drinking diet soda can actually make you much more thirsty than satisfied. Aaand I drink a lot of the “other stuff” on a daily basis. Whiiiich can be pretty explanitive of a nagging and empty feeling. I am going to work towards using this Lent season to nourish my parched soul with real hydration. With the day that I had at work on Ash Wednesday, seeing the first sign that reminded that we are not God, yeah, that replenished my reality. I need lots of reminders. 🙂 Hoping that this year, a deeper faith connection between my head and heart is created. Also, SO glad that you had such an amazing trip, to re-fill your hope and faith that gets poured out to so many. i’m so glad you made it in time and yeah, sometimes we don’t even realize how parched we actually are. it’s been interesting already, noticing thirst in a new way and how quick i am to drink things that aren’t so hot for me. love you!